iOS 9.1 is a worthwhile update with bug fixes and new emoji for most iPhone, iPad, and iPod touch users who are running iOS 9, but some users who have updated from iOS 9.0.2 to iOS 9.1 may decide they’d like to go back to the earlier version. Maybe it’s because iOS 9.0.2 has a jailbreak, maybe it’s because of some newfound issue experienced with iOS 9.1 which wasn’t there before, whatever the reason, we’ll show you how to quickly downgrade from iOS 9.1 to iOS 9.0.2. 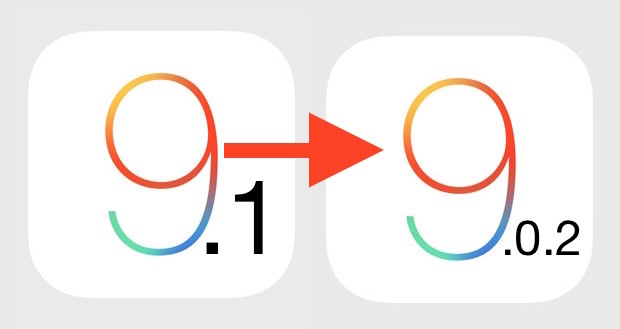 Do note that downgrading is not always possible, and though you can downgrade from iOS 9.1 to iOS 9.0.2 while Apple continues to sign the 9.0.2 release, you can’t use this process to downgrade from iOS 9.1 back to iOS 8.4.1 for example, because no version of iOS 8 is being signed by Apple. This is why upgrading iOS is often a one-way street, Apple tends to close the signing window fairly quickly. Thus, if you do want to ditch iOS 9.1 for some reason and go back to the riveting iOS 9.0.2 release, you’ll want to do it sooner than later. Pretty easy, there’s no DFU mode and no recovery mode required, iOS 9.0.2 will install onto your iPhone, iPad, or iPod touch, replacing iOS 9.1. It’s easy, but should you do this? For most users, the answer is no. But, if you want to jailbreak iOS 9 on an iPhone, iPad, or iPod touch with Pangu tool, you’d have to be running a compatible version of iOS 9.0.2, and that’s probably the only reason to bother leaving iOS 9.1 behind. A jailbreak for iOS 9.1 will be out soon, this does not seem to be necessary. iOS 9.0.2 is junk, not that iOS 9.1 is much better. iOS 8.4.1 is the best release of modern iOS at the moment, downgrading to that is no longer possible though, which is a bummer. A jailbreak for 9.1 will not be released. It was released for 9.0.2 because 9.1 patches the exploits used. I agree, I should have stayed with 8.4.1 but I kept thinking that Apple would fix the battery life in iOS 9, and now it’s too late. I will never install another update from them because they always seem to mess up my phone’s battery life. Fixed my battery issue, by doing a restore from itunes, but not doing the restore with backup. After I did the “restore”, I synced my iphone on itunes, and got everything restored that way. No more battery drains!!! And it was bad, under 3 hrs. is the longest my phone lasted!!! A couple of weeks ago I used your instructions to downgrade from 9.0.2 to 8.4.x. I downgraded because my iPhone 4s was running very slowly on iOS 9. The back up I took before hand and The downgrade appeared to complete successfully. After downgrading, I restored from an older backup from when my phone was on iOS 6. The restore completed successfully however there are two issues. When I check my phone and the Settings > General > About screen, the firmware still shows 9.0.2. The phone’s response time is doing much better, so it appears that I am downgraded even though the firmware has this iOS 9. The second issue, is that some of my apps did not restore from the backup. However when I download them from the cloud some of them have data, but some of them do not have data. iOS 9.1.0 finally fixed my 6s’ touch screen issues (freezes, slow responsiveness). I’m super happy with this update. I also don’t need JB. if i downgrade my iPhone 5s from 9.1 to 8.4.1 then it would possible to update it when new and better update is available.?? Abdulrehman, Here is a link to the article about downgrading from iOS 9.1 to iOS 9.0.2 that you should read. Interestingly enough, the second paragraph of that article about downgrading from iOS 9.1 directly mentions how downgrading to iOS 8.4.1 is not possible any longer and why it isn’t possible, but you must actually read the words on the screen to get this information. You won’t be able to downgrade because Apple removes the old 9.0.2 server info to get that firmware. You will get an error. Jailbreaking really is a fast way to brick your phone for features that mostly won’t work correctly anyways. Were you able to downgrade to 9.0.2? And how did you bypass this thing? Jail breaking gives me switches for 3G, Low Power Mode, Location Services right in my control centre. It also puts a switch for Ringer on/off which is handy as my mute button is faulty. I also have swipe selection for text running on iPhone 4S. F.Lux Adjusts the colour tone to be easier on the eyes. I can also switch the ringer on with a text message. Handy if I misplace my phone and need to find it. Mostly useful features that Apple should have already integrated like they did with the lowercase/uppercase keyboard but hey, we’ll leave these for teenagers and android wannabes right? Jailbreaking has loads of uses, especially for what can be done on iOS. Although I do understand it isn’t for everyone, especially like simpletons such as yourself. I jailbreak my iPhone 6, but when I try to open cydia, it instantly crashes. Now, for what I have read I must restore de iPhone but if I do so it will update to iOS 9.1 right? Is something a can do so restore to iOS 9.0.2 again? to downgrade from ios 9.1 to ios 9.0.2 now ? or apple doesn’t support the ios 9.0.2 !!!! No it is not possible any longer. When i downgrade ios 9.1 to 9.0.2 error 3194 has come pl help me. I have to try downgrade ios 9.1 to 9.0.2 but still error 3194 has come pl help me. Hmm let me think, what about buying a new? if its about the money i would recommend 5c, might be the best iphone i´ve had, even tho i have used 4,4s,5,5s,6 and now 6s. Used the C after i broke my glass on the 5s..
i have 8.3 jailbreak . should i upgrade to 9.0.2 ios and than jb it ? ragazzi, io ho un iphone 5 con ios 7.01 jailbreak, como facio ad instalare io s 9.1 nel iphone ? è possibile passare solo per la versione ios 9.1? senza dover passare a ios 9.3?